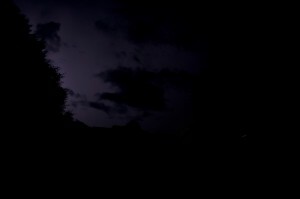 Finally Some Lightning … IT WORKS! Tonight, I was finally able to deploy the prototype of my lightning trigger. The storm wasn’t particularly photogenic, but it at least helped prove the concept. Lightning was slim and no bolts were in the best area for my camera, but the camera did capture the image to the right. Not very good I know, but if it will work for such a poor example of lightning, I think during a real storm it will perform splendidly. My next steps are to research moving to a wired trigger (replacing an MC-DC2 ) instead of the IR LED, add a potentiometer to adjust the sensitivity in the field, and installing the circuit into a project box. Perhaps this won’t be a problem during a storm with a lot of lightning, but one problem that I encountered was that the camera would exit the “Quick-response remote” release mode and return to my prior setting in the absence of regular input. I guess this was due to the camera entering a suspended state. I will have to see if I can modify this setting, if not I may attempt to keep the camera awake.